Vacations are bad for the environment, according to a study that appeared last week in Nature Climate Change. It showed that tourism is responsible for 8% of global CO2 emissions. Roughly twice as high as previous estimates. This difference is mainly due to the fact that, unlike previous research, it wasn't just the climate impact of the trip itself that was calculated, but also the impact of the supply of food and drinks and the construction and maintenance of hotels and airports. Does this mean that, in order to save the environment, we should forget about exotic and distant destinations but rather take the train to a campsite in the country instead? Well, the figure of 8% is debatable, because it is an estimate. Reliable numbers aren't available for 100 of the 160 countries that were investigated, and these had to be derived from other sources. Business travelers were also included in the calculation because they were not separately registered in the definition of a "tourist" by the UN. The researchers state, however, that private travel is responsible for the majority of all trips worldwide, so this would not introduce a large error. But whether tourism accounts for precisely 8% of global emissions is not certain. The research does make clear that previous studies have underestimated the climate impact of tourism - and that Norwegians have an exceptionally high contribution to that impact, because they have a high income and travel a lot. Moreover, international tourism is increasing considerably, by about 4% per year. If the share of global CO2 emissions from tourism isn't 8% right now, it will undoubtedly reach that number in the future - unless we take measures to prevent that. I also fly from time to time, and it bothers me that it's so bad for the environment. When I recently flew to the Netherlands to visit my family, KLM offered to compensate me for the emissions of my flight. They invest that money, for example, in cleaner cooking appliances in Africa. Normally I do not do this, because it feels a bit like paying off my CO2 sins. Besides, these kinds of programs are often not well-defined, and it remains unclear whether they really work. This time, for a change, I decided to pay the 2 euro thinking "it doesn't hurt to try". But only 1 out of 535 passengers opt for this possibility according to the airline company's own figures. A drop in the ocean. Moreover, tourism has a much broader impact on the environment and climate than just CO2 emissions. Cruise ships, for example, emit large quantities of soot. When this is carried along with the wind and ends up on snow, glaciers, or sea ice, it accelerates their melt. Even if these ships stay away from unspoiled nature and only visit inhabited areas, it isn't much better. Emissions from cruise ships are barely regulated, so they raise air pollution unimpeded in the cities where they make port. Apart from soot, these ships also emit thousands of people. Combine that with the number of tourists that fly to cities like Barcelona and Venice every day and it is clear that an untenable situation arises. These cities are starting to look more like amusement parks than like a place where people actually live. We also see these problems in Norway: in Flåm, in Longyearbyen and at Preikestolen you cannot see the fjord for the tourists. 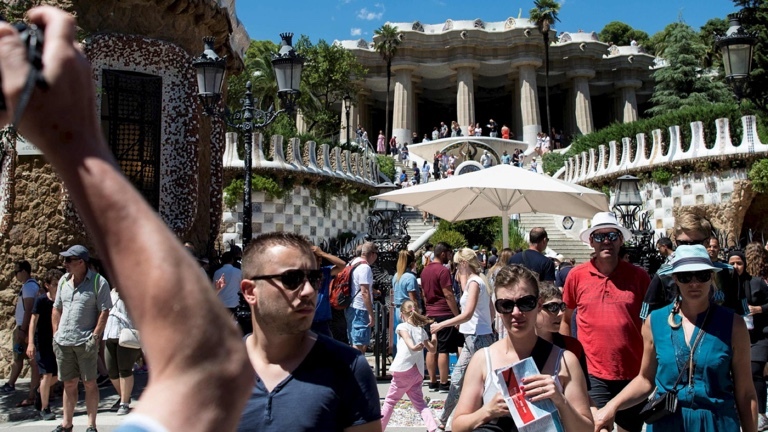 Cities such as Barcelona receive so many tourists that it is almost impossible to live there. I do not want to preach that going on vacation has to be taboo from now. On the contrary. Holiday is a time of year when we can leave our everyday stress behind and get to know other cultures. A broader world view and a better understanding of each other makes our society better, even if this comes at the expense of some CO2 emissions. But a balance needs to be found. A return flight Oslo-New York emits enough CO2 to melt three square meters of sea ice. This creates a certain responsibility. There is a big difference between a weekend trip to go shopping with a jetlag in Manhattan, or a tour of the US of a few weeks where you learn that the country is a lot more nuanced and more diverse than you see on TV. Spend your CO2 wisely. That wisdom can also be applied more broadly. Yes, flying is bad for the climate - but if you only pay attention to your CO2 emissions when you go on vacation and are stuck in traffic jams every other day of the year with a petrol-guzzling car, you will not help the climate any further. Looking at the climate problem with blinders on does not work. It can lead to symbolic politics. Extinguishing the lights on "Earth Day", one day in the year to clean up litter on beach shores, or one flight less: this will not solve the climate problem. A widely supported awareness among the population that something has to change, translated into a progressive environmental policy of the government can solve this. Something to think about, at the campsite.